Abstract: We introduce the "exponential linear unit" (ELU) which speeds up learning in deep neural networks and leads to higher classification accuracies. 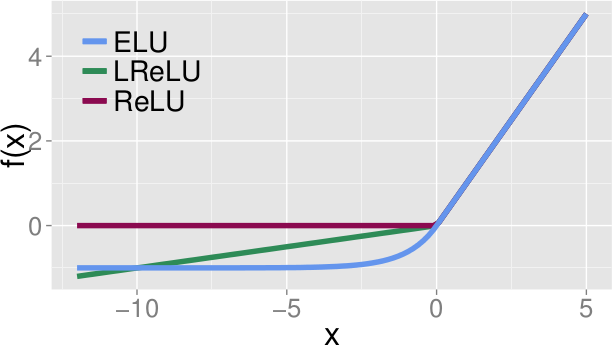 Like rectified linear units (ReLUs), leaky ReLUs (LReLUs) and parametrized ReLUs (PReLUs), ELUs alleviate the vanishing gradient problem via the identity for positive values. However, ELUs have improved learning characteristics compared to the units with other activation functions. In contrast to ReLUs, ELUs have negative values which allows them to push mean unit activations closer to zero like batch normalization but with lower computational complexity. Mean shifts toward zero speed up learning by bringing the normal gradient closer to the unit natural gradient because of a reduced bias shift effect. While LReLUs and PReLUs have negative values, too, they do not ensure a noise-robust deactivation state. ELUs saturate to a negative value with smaller inputs and thereby decrease the forward propagated variation and information. Therefore, ELUs code the degree of presence of particular phenomena in the input, while they do not quantitatively model the degree of their absence. In experiments, ELUs lead not only to faster learning, but also to significantly better generalization performance than ReLUs and LReLUs on networks with more than 5 layers. On CIFAR-100 ELUs networks significantly outperform ReLU networks with batch normalization while batch normalization does not improve ELU networks. ELU networks are among the top 10 reported CIFAR-10 results and yield the best published result on CIFAR-100, without resorting to multi-view evaluation or model averaging. On ImageNet, ELU networks considerably speed up learning compared to a ReLU network with the same architecture, obtaining less than 10% classification error for a single crop, single model network. * `alpha` defines at which negative value the ELU saturates. * LeakyReLUs however can go to `-Infinity`, ReLUs can't go below 0. * They derive from the unit natural gradient that a network learns faster, if the mean activation of each neuron is close to zero. * ReLUs can go above 0, but never below. So their mean activation will usually be quite a bit above 0, which should slow down learning. * ELUs, LeakyReLUs and PReLUs all have negative slopes, so their mean activations should be closer to 0. * In contrast to LeakyReLUs and PReLUs, ELUs saturate at a negative value (usually -1.0). * The authors think that is good, because it lets ELUs encode the degree of presence of input concepts, while they do not quantify the degree of absence. * So ELUs can measure the presence of concepts quantitatively, but the absence only qualitatively. * They think that this makes ELUs more robust to noise. * In their tests on MNIST, CIFAR-10, CIFAR-100 and ImageNet, ELUs perform (nearly always) better than ReLUs and LeakyReLUs. * However, they don't test PReLUs at all and use an alpha of 0.1 for LeakyReLUs (even though 0.33 is afaik standard) and don't test LeakyReLUs on ImageNet (only ReLUs). * ReLUs are sparse and avoid the vanishing gradient problem, because their derivate is 1 when they are active. * ReLUs have a mean activation larger than zero. * Non-zero mean activation causes a bias shift in the next layer, especially if multiple of them are correlated. * The natural gradient (?) corrects for the bias shift by adjusting the weight update. * Having less bias shift would bring the standard gradient closer to the natural gradient, which would lead to faster learning. * Centering activation functions at zero, which would keep the off-diagonal entries of the Fisher information matrix small. * These solutions have the problem, that they might end up taking away previous learning steps, which would slow down learning unnecessarily. * Chosing a good activation function would be a better solution. * Previously, tanh was prefered over sigmoid for that reason (pushed mean towards zero). * Such activation functions with non-zero slopes for negative values seemed to improve results. * The deactivation state of such units is not very robust to noise, can get very negative. * They suggest an activation function that can return negative values, but quickly saturates (for negative values, not for positive ones). * So the model can make a quantitative assessment for positive statements (there is an amount X of A in the image), but only a qualitative negative one (something indicates that B is not in the image). * They argue that this makes their activation function more robust to noise. * Their activation function still has activations with a mean close to zero. * Hessian-Free Optimization techniques use an extended Gauss-Newton approximation of Hessians and therefore can be interpreted as versions of natural gradient descent. * Computing the Fisher matrix is too expensive for neural networks. * Methods to approximate the Fisher matrix or to perform natural gradient descent have been developed. * Lots of formulas. Apparently first explaining how the natural gradient descent works, then proofing that natural gradient descent can deal well with non-zero-mean activations. * Natural gradient descent auto-corrects bias shift (i.e. non-zero-mean activations). * If that auto-correction does not exist, oscillations (?) can occur, which slow down learning. * The negative values of ELUs push the mean activation towards zero. * Mean activations closer to zero resemble more the natural gradient, therefore they should speed up learning. * ELUs are more noise robust than PReLUs and LeakyReLUs, because their negative values saturate and thus should create a small gradient. * "ELUs encode the degree of presence of input concepts, while they do not quantify the degree of absence"
* They compare ELUs to ReLUs and LeakyReLUs, but not to PReLUs (no explanation why). * They seem to use a negative slope of 0.1 for LeakyReLUs, even though 0.33 is standard afaik. * They use an alpha of 1.0 for their ELUs (i.e. minimum value is -1.0).